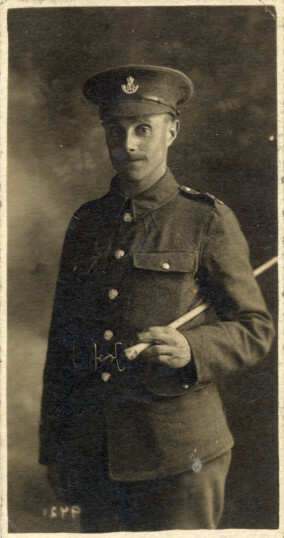 Enlistment photograph of Private Philip Sutton, March 1916. 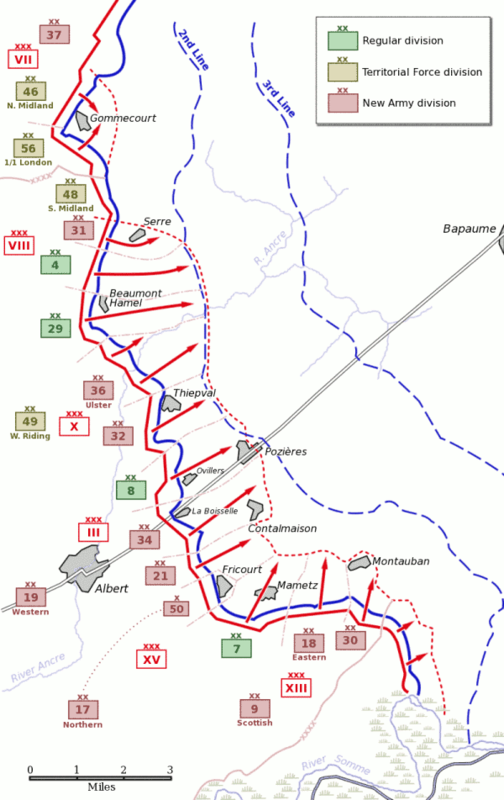 Outline map of the Somme battlefield, 1916, showing the position of the 50th Division at the start of the actions. 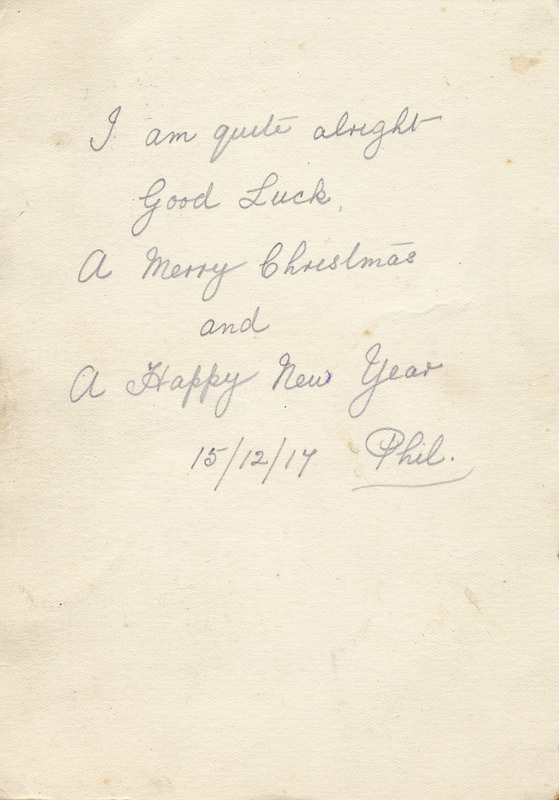 A Christmas Greetings 1917 card send by Private Philip Sutton to his family from the Western Front. 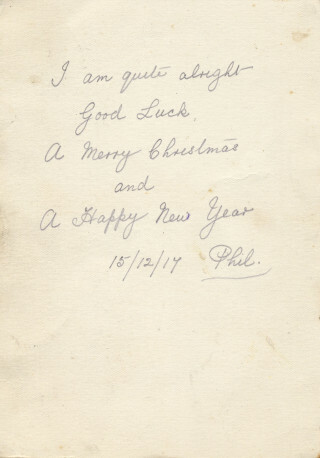 Philip Sutton's soldier's identity tag, and the letter which was sent by an anonymous German soldier in June, 1919 to his family. 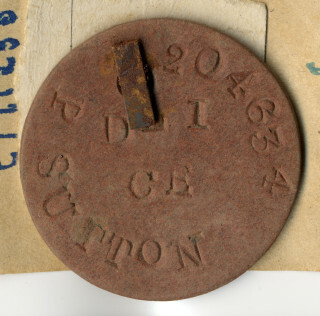 A close up picture of Private Philip Sutton's identity tag. Headstone in St Mary's churchyard, Bottesford. 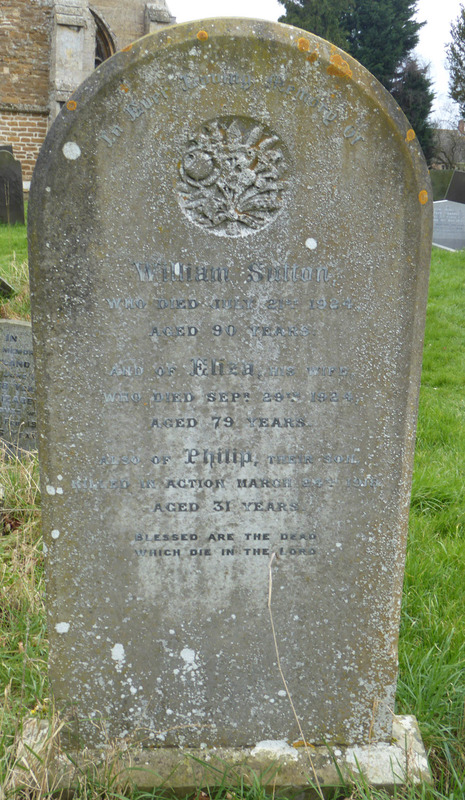 The caption reads: William Sutton, who died July 21st 1924, aged 90 years, and of Eliza, his wife who died September 29th 1924, aged 79 years. Also of Philip, their son, Killed in Action March 24th 1918, aged 31 years. "Blessed Are The Dead Which Die In The Lord"
Philip Sutton was born on the 27th August, 1886, the second son of William Sutton, born 1834 in Bottesford, and Eliza Sutton, born 1845 in Woolsthorpe. At the date of the Census of 1891, the family lived at their grocery shop on the High Street, Bottesford. There were four children, John William (born 1885), Philip (born in the third quarter of 1886), Jane (born 1888) and Ann (born 1890), and also William Sutton’s nephew, another Philip Sutton (born 1867), working as his assistant. John William Sutton survived his military service in WW1, as a Private in the Somerset Light Infantry. In 1901, their address was 12 High Street (shop). John had left home, but Philip (now 14, an apprentice butcher), Jane and Ann were there. In 1911, the address was 11, High St, Bottesford. William was 77 though still running the family business, Eliza was 66. Philip was now 24, a butcher (apprenticeship long behind him), Jane was 22 “working at home”, and Ann 21 was also “working at home”. It appears that the three children were working in their elderly father’s shop. Philip had not married. By 1916, Philip’s mother Eliza had moved to Albert Street. 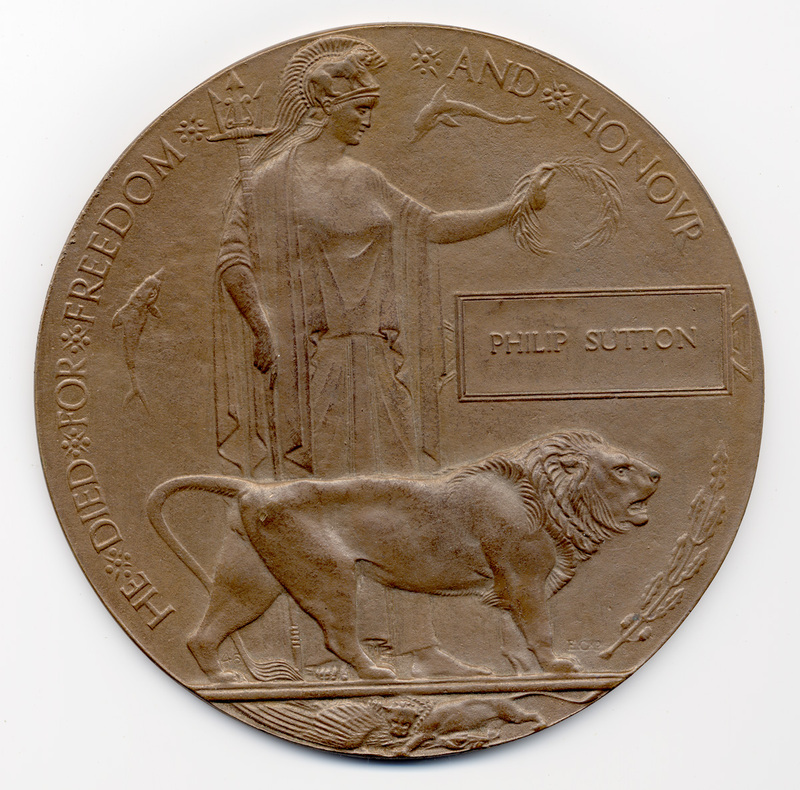 Philip Sutton enlisted on the 11th March, 1916, at Leicester, a butcher, single, aged 29 years 240 days. He was posted as Private 204634, 1st/6th Battalion, Durham Light Infantry. The 6th Battalion was part of the 151st Brigade (Durham Light Infantry), along with other Battalions of the DLI, and a variety of other regiments. The 151st Brigade was itself part of the 50th (Northumbrian) Division. 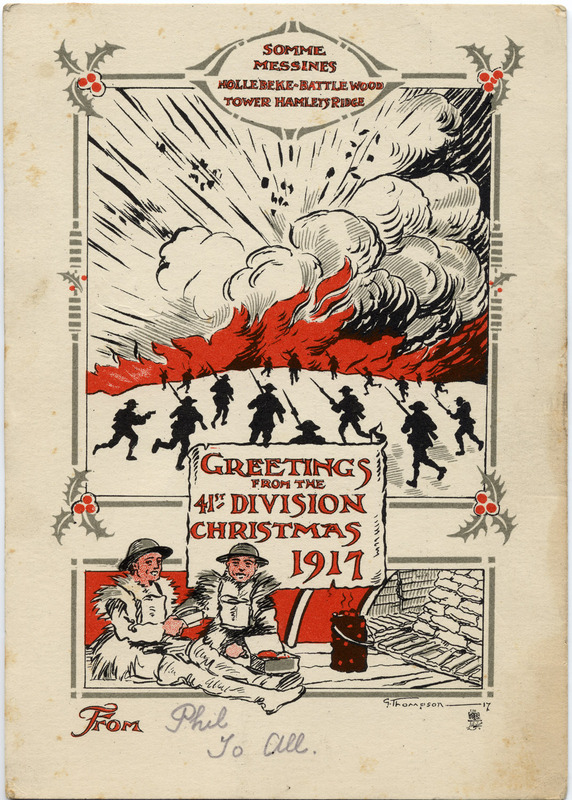 The 6th Battalion was involved in many of the actions on the Western Front from 1914 to July 15th, 1918, almost the whole of the war. He landed at Boulogne on the 16th July, 1916 and joined his battalion. He received severe shrapnel wounds to his left thigh on the 15th September, 1916, and was transported back to the UK to be treated at the Western General Hospital. This was during the prolonged actions of the summer and autumn of 1916, the Battle of the Somme. The 50th Division was part of the enormous number of Allied troops assembled to attack the German lines, to little avail. 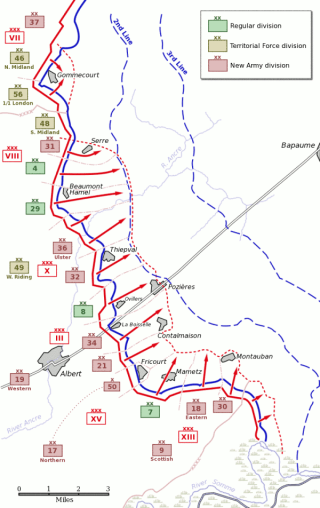 In September, the 6th Battalion was one of the units struggling to gain a location known as Le Transloy ridge. The account given by Wikipedia is: Le Transloy ridge was the next target in the increasingly wet autumn, this involved the 2nd battalion, the 6th, 8th (temporarily joined with the 1/5th Borderers) and 9th territorials and the 12th and 13th service battalions. These last two captured the village of Le Sars in what the Official History called “…the striking success of the day.” The territorials were again involved in the last assault of the Somme offensive, on the Butte de Warlencourt, the 1/6th, 1/8th and 1/9th losing between them nearly 940 officers and men killed, wounded or missing for no gain. It is not certain when Philip Sutton had recovered enough to return to France and rejoin his battalion. Little has been unearthed about him in 1917 from the records available online. However, in January, 1918, he was once again admitted to hospital (in France), to be treated for myalgia (muscle pain, which may be chronic fatigue syndrome or result from viral infections). 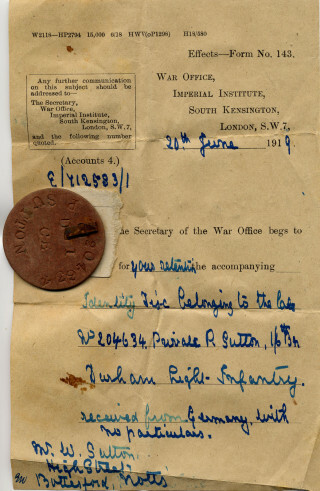 He rejoined the battalion on the 28th February. He was reported missing on the 24th March, 1918. An official letter dated 29th April, 1918, located among his service records, commented “no news”. The Durham Light Infantry were particularly badly hit during the German Spring Offensive which started on the 21st March, 1918. The following extract from the account in Wikipedia makes this clear. On the first day of the German “Operation Michael” the 2nd battalion was in the front line north of the Bapaume-Cambrai road. After losing the two forward companies, the infantry withdrew in the evening mist with the remains of the 1st battalion West Yorkshire Regiment. At dusk on the 22nd, out of an original strength of 30 officers and 639 other ranks, the battalion had two officers and 58 men unwounded with six officers and 286 other ranks wounded. The 11th pioneer battalion was building a supply railway in the 20th Division’s rear, in the Saint-Quentin area around Ham. It was scattered during the week long battle, and only a few men regrouped in Amiens at its conclusion. All the regiment’s battalions on the Western Front suffered heavy losses as a result of the weight of numbers and new tactics of the Germans. The 18th, 19th and 20th battalions also fought on the Somme. The 9th battalion fought before Bucquoy at the end of March where Pte Young won the V.C. for rescuing 9 men under fire. When relieved on 1 April, the battalion had lost 492 officers and men, and the 15th battalion reduced to one company. The territorials of the 50th Division, the 5th, 6th and 8th battalions and 7th pioneers were particularly unfortunate, forced into the long retreat on the Somme, they were reinforced by drafts from the graduated battalions and sent to the Ypres salient in April where, after the initial assault they were only saved by the German looting: “I think the only thing that saved us that night was the amount of liquor the Boche found in Estairs and Neuf-Berquin, as I have never heard such a noise in my life as they made singing.” — 5th Battalion officer. Reduced to a total of a battalion in strength, the 151st Brigade was then sent to the Aisne to recuperate where a third German attack found them on 26 May, 21 days after arriving. The scattered parties were forced back to south of the Marne where eventually the Durham battalions of 151 brigade could only muster 103 men of all ranks. Philip Sutton had been reported missing in action during the early days of the Spring Offensive. Strictly speaking, March 24th was the last date on which he was known to be alive. The British were pushed back, and so prevented from sending out rescue parties to recover casualties. It was possible that he had been captured rather than killed, and so his death was not accepted until this possibility had been discounted, almost a year later. The Grantham Journal, on the 11th May, 1918, reported: Bottesford. 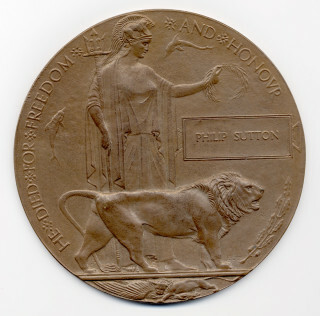 Pte Philip Sutton, Durham Light Infantry, son of Mr. Wm. Sutton, High-street, has been officially reported missing since March 24th . He was wounded in September, 1916, and returned to France in July last year. His relatives have hopes that he is a prisoner of war. On the 22nd February, 1919, the Grantham Journal had to report: Pte Philip Sutton, Durham Light Infantry, and youngest son of Mr. William Sutton, of Bottesford, was reported missing on the Great German offensive in March. Official news has now been received by the family that he fell in action on or since 24th March, and was buried between Baux-Wancourt and Benynaire. Pte Sutton was 32 years old, and had been in the Army three years, having been previously wounded on the Somme. Before the war, he was a member of the Territorials, and was the winner of several shooting prizes. The relatives would be glad to hear from any one who can give them particulars of his death. His body was never recovered, but his death was not officially recognised until the authorities were assured that he had not become a prisoner of war. He is commemorated at Pozieres Monument, which includes inscriptions of approximately 600 names of men of the Durham Light Infantry: (see PDF certificate). The Pozières Memorial is located on the north side of the D929 Albert-Bapaume road, just to the south of the village of Pozières in Flanders.